ORLANDO, Fla. – Mission accomplished! With the mission of going back-to-back for the first time in school history as well as be the first Duval County public school to go back-to-back, the mission was set the moment claimed the 2017 FHSAA Class 4A State Championship. And on Thursday night with a 27-13 win over Cocoa (10-4) in a rematch of last year’s state championship game, the Raines Vikings (13-1) are heading back to Jacksonville with the sweetest victory of them all – that after starting the season 0-1 after a 16-15 loss to Robert E. Lee. The first half of the game was pretty much neck and neck between the two teams with each holding their own, but it was a fourth-quarter defensive stand with some impressive offensive help by Raines that allowed them comfortable close out things after Cocoa drew within one with 5:13 left to go. But the first quarter started off a bit sluggish for both the Vikings and Tigers who worked the first part of the quarter trying to figure each other out. After going three-and-out on the first drive, Raines was forced to punt with just three minutes off the clock, but a muffed punt by Cocoa gave the Vikings the ball right back at the Tigers 11. However, after some costly penalties, Raines failed to convert on fourth down and coming up empty handed on points. With not much success on Cocoa’s first drive of the game, Raines took their second drive down the field with Jacorey Rivers, showing his moves in his second start of the season after gaining a start last week against Dunnellon in the state semifinals, drove the Vikings down the field for a 7-0 score with 4:17 left in the first quarter on a Brandon Marshall five-yard touchdown rush. A long sustaining drive on Cocoa’s second drive prove to be unfruitful for the Tigers and heading into the second quarter Raines took control of the momentum as Jacorey Rivers and Brandon Marshall busted off some big runs that allowed Jamond Handy to scored the Vikings second touchdown of the night to go up 14-0 with 7:51 left in the half. However, Cocoa finally got things going an sustained things for a drive on their next drive, sparked by DJ Arroyo’s 42 yards pass to Willie Gaines to set up a four-yard touchdown pass to Caziah Holmes to cut Raines’ lead to 14-7 with 6:11 in the first half, which would be the score going into halftime. With the ball to start the second half, Cocoa was looking to get momentum to swing their way and did after failing to score points on their first possession and getting Raines to go three-and-out along with an interception, to dominate the third quarter. However, instead of a touchdown to draw the score even, Cocoa came up 1-of-2 on field goals to bring the score to 14-10 Raines with 8:17 left in the third quarter. The closest Cocoa would come to Raines all night was when Alex Petruzzello knocked in a 24-yard field goal with 5:13 left in the game to close the gap by one, 14-13. But that is when the wheels fell off for Cocoa as Raines took their next possession and in only two plays Barron Coates threw a 74-yard completion to Brandon Marshall, who finished 58 yards rushing and one touchdown as well as 77 yards receiving, to put Cocoa up 21-13 with 4:04 left. To seal the deal fully for the Vikings, Treyvon Hobbs intercepted Arroyo’s pass at their own 34, returning it 66 yards to make 27-13 after a missed extra point with 3:02 left. 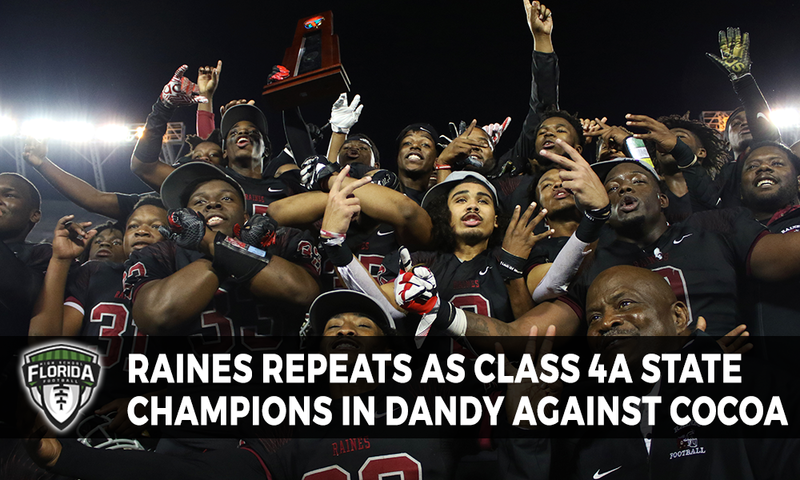 “I am almost speechless,” Raines Head Coach Deran Wiley said after the game on his team going back-to-back as State Champions. “Don’t take away anything from Cocoa. Those guys are very good. We made some plays. The defense, man… those guys go to war. They played down the stretch. That pick six with Trevyon Hobbs was unbelievable. We are going to celebrate tonight,” Wiley said.